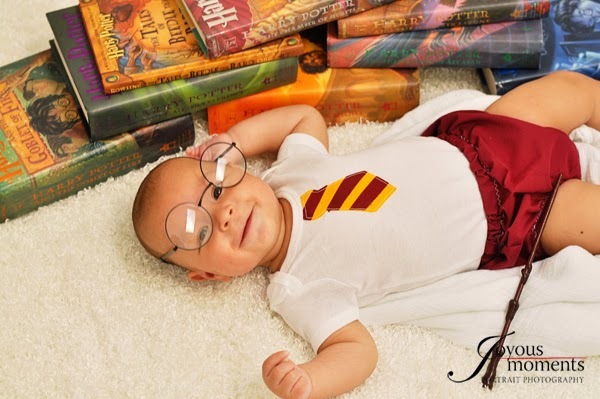 Ever since Marissa from Rae Gun Ramblings and I had babies a couple months apart, we have been taking Harry Potter themed picture of our little ones every single July. It has been something I look forward to each year and I giggle every time I see the photos. Here are all of crazy and fun ideas for taking Harry Potter pictures with your kids. With all the photos, I linked to where we got the props and the costumes so you can take you own photos too. Teddy is about five months old in these photos and not sitting up yet, so all of these photos are set up to be safe for an uneasy sitter. Teddy is already Harry Potter lucky because his mom sells the cute outfit he is wearing in her Rae Gun Shop. You can find his outfit here. The glasses are apart of this costume set found here. The Scarf, Wand and Hogwarts Letter come from the Pieces By Polly Etsy Shop found here. I couldn’t find the exact suitcase set I used in these pictures but this set here would work too. For this photo, we wanted Teddy to sit up so we could get a better glimpse of the glasses and scarf. 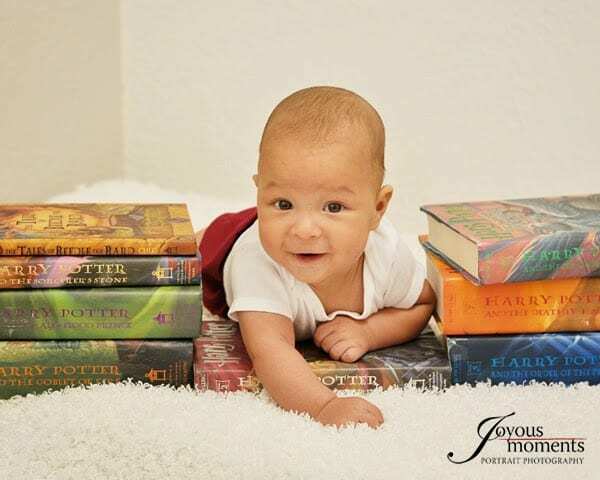 The easiest way to do this was to put a pillow in the corner of the room, drape the backdrop over top of it and prop him up, with the security of his mom only a step away. 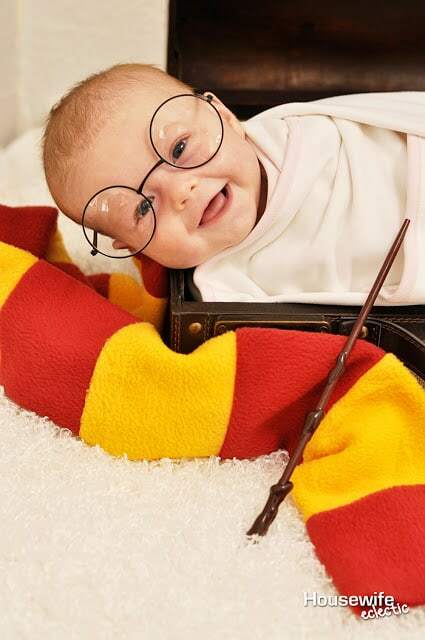 Or lay the baby swaddled in a suitcase with the glasses on. Notice in this photo that the scarf is right under her face so that she doesn’t get hurt by the suitcase edge. This is absolutely one of my favorite picture. 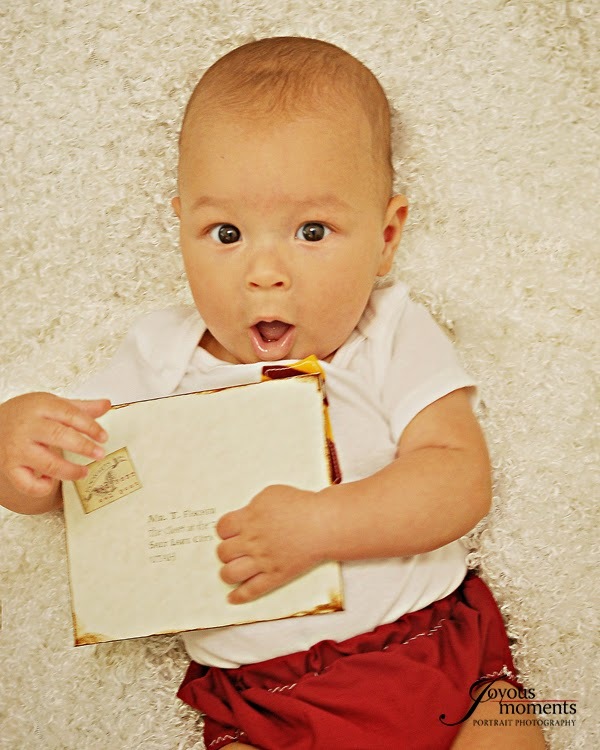 He is just so excited that he finally got his Hogwarts Letter. These next few pictures are perfect for people who might not want to spend a lot of money on props. You just need a copy of the books for these ones. 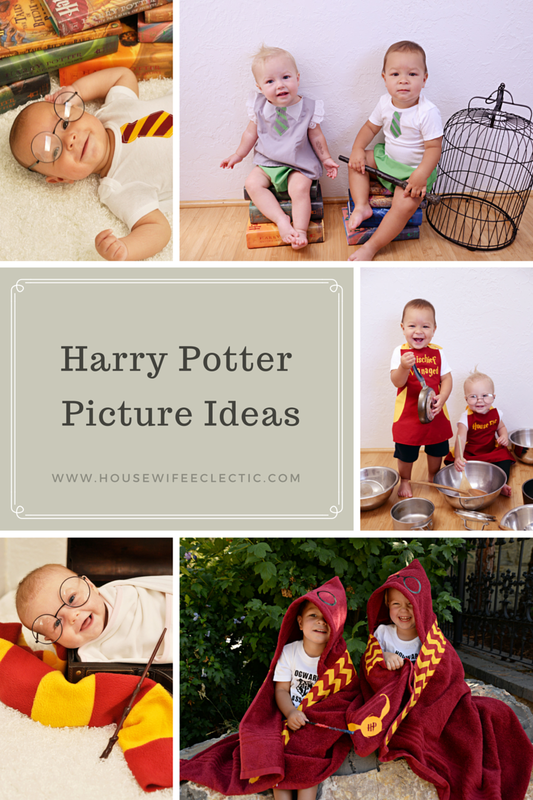 The above picture is perfect if you have a sleepy baby but want to take a few more picture. 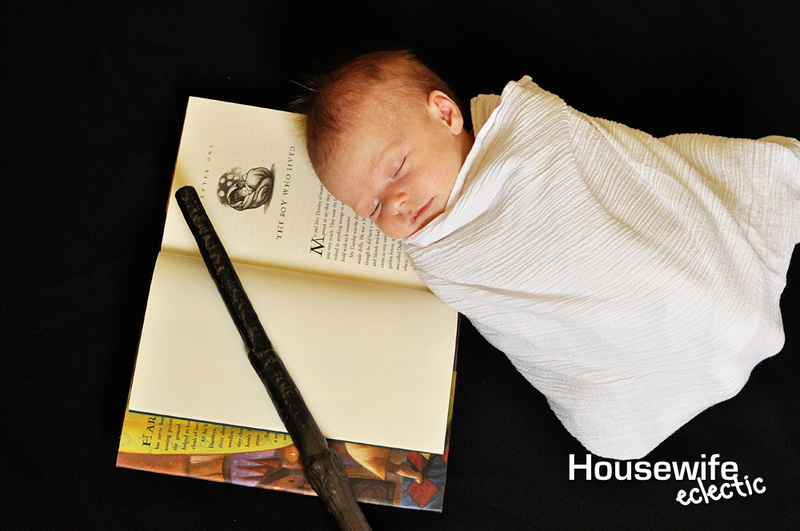 Swaddle them in a white blanket and when they are asleep lay them down with the props. For this picture, the books are not stacked in order, but set to make more even piles. After a couple of times of trial and error, we found that the second book, Chamber of Secrets, was the perfect height for the baby to lay on. The picture below is one of my favorites. For safety reasons, it is a composite image, or an image that is made up of two images. There are a few steps you can take when shooting to make putting together a composite image a snap. Have your parent hold the baby securely with a hand. Take pictures until you have one you love, then have the parent move their hand to a completely different spot and take a few more pictures. 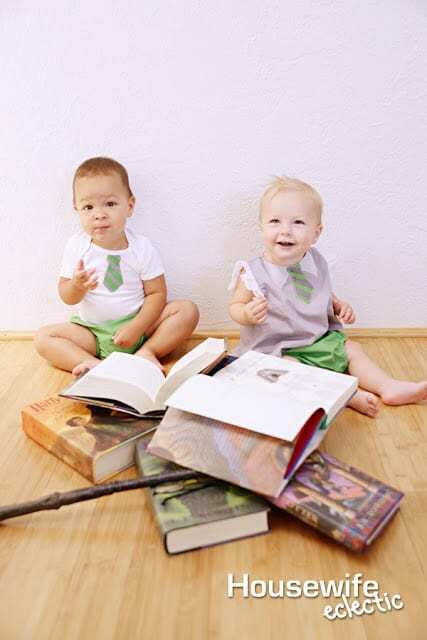 This way you will have two picture that combine easily for a cute, and parent free picture. The cute bird cage in the photo was purchased at Tai Pan Trading, which doesn’t have an online store, but you can find a similar one here. 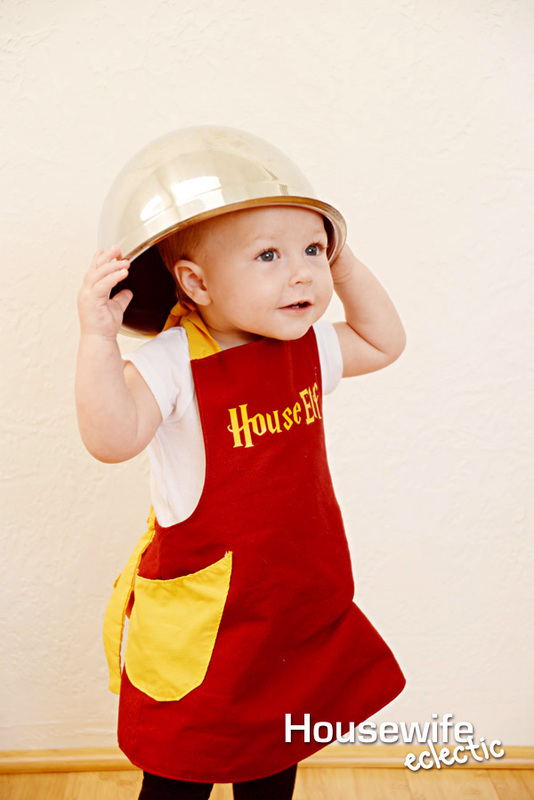 For our second year of Harry Potter costumes, we went with House Elf Aprons and Kitchen supplies. 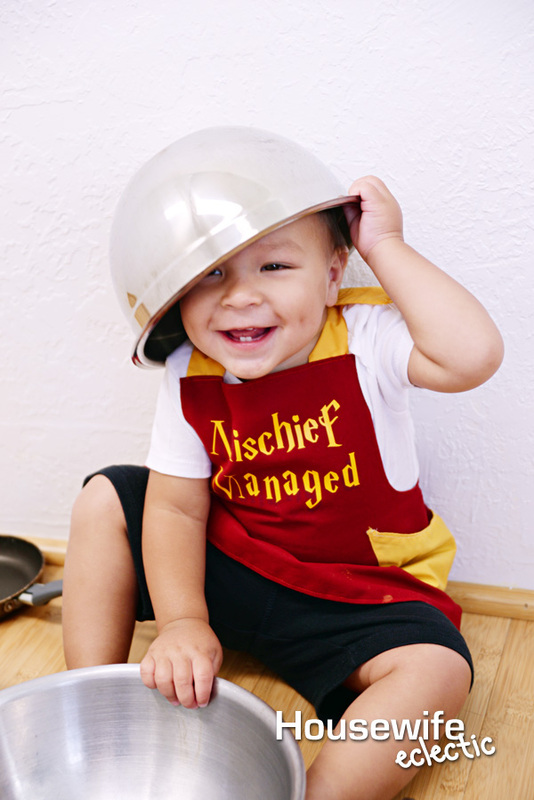 Find the House Elf Aprons here. 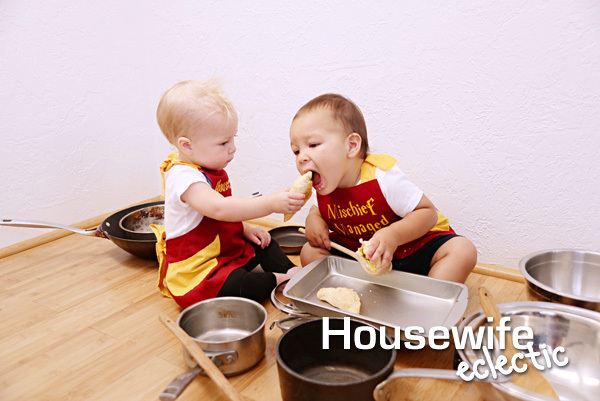 It was such an easy set up, because we just needed the apron and then kitchen items that we already had on hand. We raided Marissa’s kitchen and pulled out every pot and pan for a fun picture. We even let the kids enough some pastries while we were taking pictures. The hardcover books with the colorful dust jackets are always going to be the best prop, so just augment them with other items. 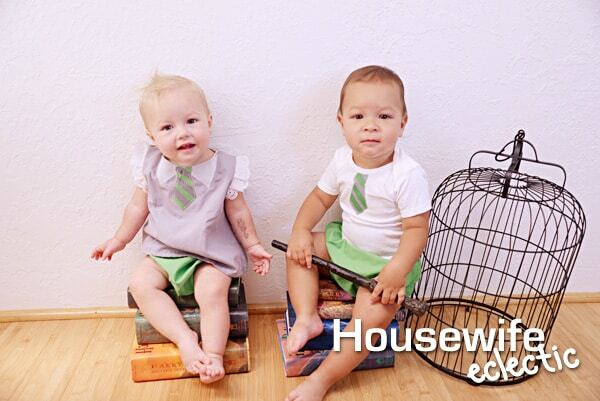 We also did Slytherin costumes this year and Marissa had a dark mark stamp for the kids arms. Seriously best thing ever. You can find the Slytherin Costumes here. 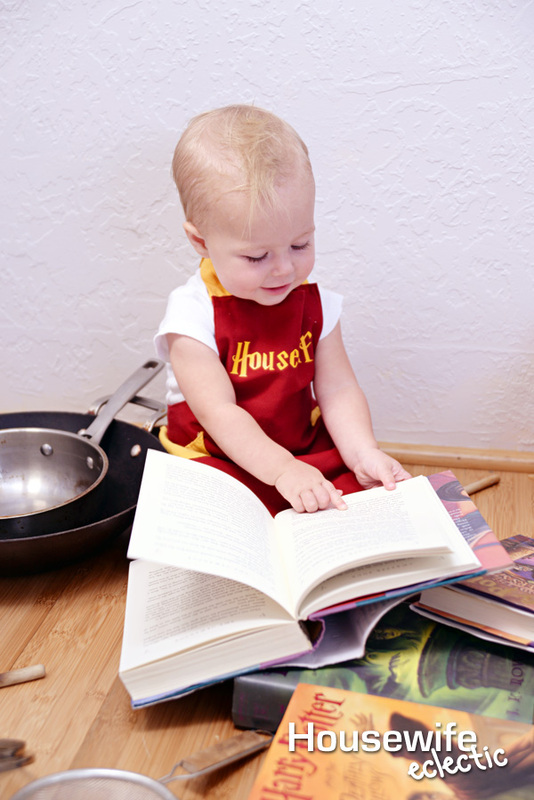 For these photos we mostly used the books as props. The birdcage in this photo is the same one that we used the year before from Tai Pan Trading. For year three of Harry Potter photos, Marissa made play wands out of dowels, hot glue and paint and we dressed the kiddos up in Hogwarts Class Shirts. I am pretty sure this is my favorite picture. With Teddy hexing Hailey’s nose. 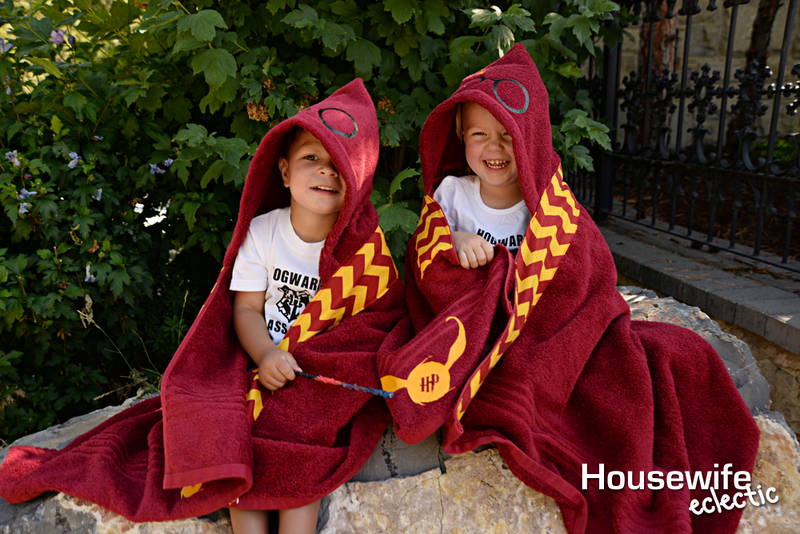 These Harry Potter towels are absolutely darling and a easy way to add a lot of Harry Potter into one picture. 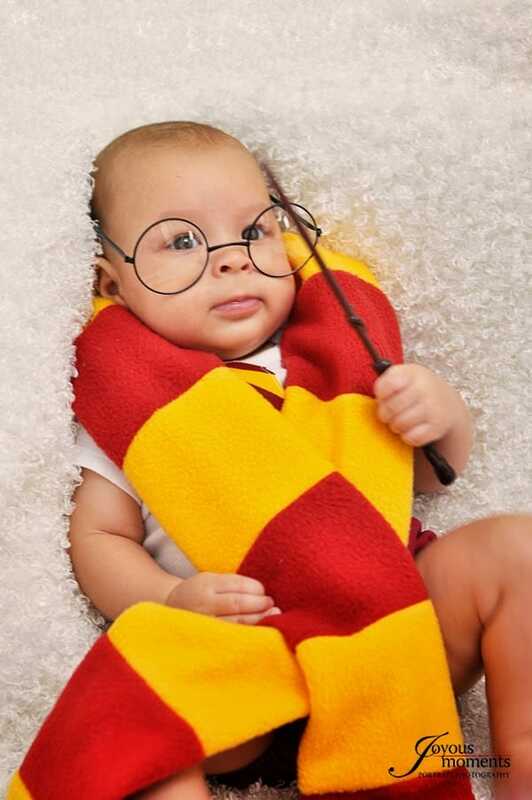 The glasses on the hood along with the lightening bolt scar are my favorite. 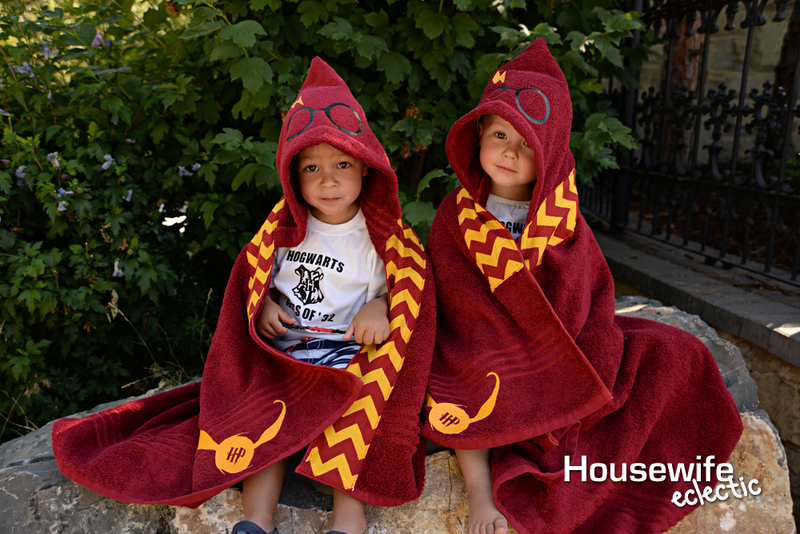 You can order the towel here. I am not sure what next year will hold for these Harry Potter kiddos, but I already know it is going to be fabulous. 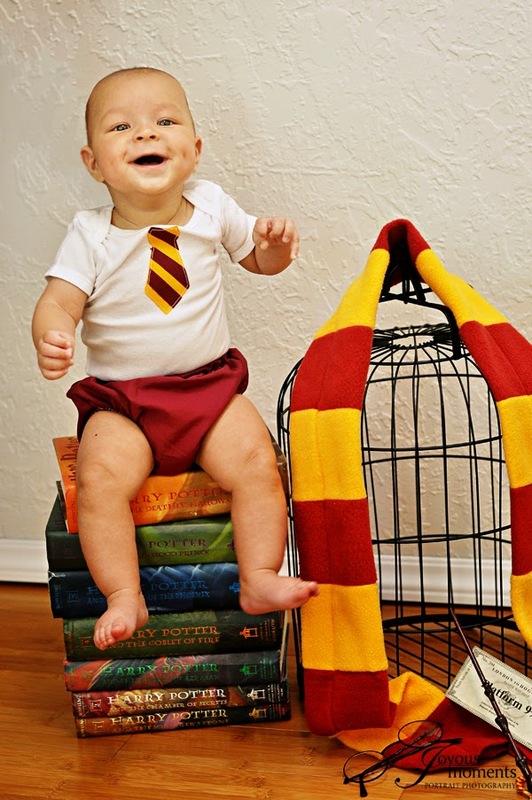 Have you every done Harry Potter Pictures with your kids?